The distribution of long-lasting insecticide-treated nets and water filters to prevent malaria and water-borne diseases can significantly reduce the rate of HIV disease progression among Kenyan adults not yet eligible for treatment, an international research group reported on Wednesday at the 19th International AIDS Conference (AIDS 2012) in Washington DC. Receipt of these items was associated with a 27% reduction in the risk of reaching the CD4 cell threshold for starting treatment among people living with HIV, but not yet eligible for treatment, during two years of follow-up of a prospective cohort, reported Judd Walson, Associate Professor in the Department of Global Health at the University of Washington, Seattle. A related study estimated that, if the same effect were seen throughout sub-Saharan Africa after the distribution of these products to people living with HIV, the intervention would have the potential to save just over US$400 million a year in antiretroviral treatment costs, if all adults were able to start treatment when their CD4 cell counts fell below 350 cells/mm3. Both malaria and water-borne infections have been proposed as influencing HIV disease progression, but previous evidence about their effects has been mixed. Unclean water is the major source of infectious causes of diarrhoea in people with HIV, while malaria can cause temporary increases in viral load. The study examined the impact on the health of people living with HIV infection of receiving the insecticide-treated net and water filters during a multi-disease prevention campaign in communities in western Kenya. The multi-disease prevention campaign was designed to promote the prevention of three causes of disease associated with high levels of morbidity and mortality in many regions of sub-Saharan Africa. A prevention programme that can address all three diseases is likely to have greater reach and achieve substantial economies of scale as a result of the distribution of prevention commodities targeting the three different diseases through one distribution channel. The data presented this week in Washington show that the prevention of malaria and water-borne diseases has an impact on the health of people living with HIV, and also has the potential to save money, by delaying the start of treatment in settings where the numbers needing treatment may exceed the funds available to provide immediate treatment for all who are eligible. In the Kenyan pilot study, conducted in western Kenya, the Ministry of Health partnered with local community groups and an international NGO to run a multi-disease prevention campaign, which advertised free HIV counselling and testing at central locations in the largely rural district, during a one-week campaign that used community mobilisation activities to raise awareness of the opportunity for HIV testing. Everyone who attended the campaign events was offered voluntary counselling and testing. Previous reports from the campaign showed very high uptake, of around 99% among those who received the care package. Four per cent of those who underwent HIV testing tested positive in the first campaign in 2008, and previously published research showed that people who tested during the multi-disease prevention campaign were diagnosed at significantly higher CD4 cell counts than people diagnosed through provider-initiated testing and counselling at local hospitals. Everyone who attended and consented also received a CarePack – a canvas bag containing a PermaNet long-lasting insecticide treated net, manufactured by Vestergaard Frandsen, and a LifeStraw water filter, also manufactured by Vestergaard Frandsen. The CarePack also provided condoms, and at the campaign events everyone received education on the use of the insecticide-treated nets, the water filters and condoms, together with general information about the prevention of malaria, water-borne diseases and HIV infection. Everyone diagnosed with HIV was linked to care by a 'navigator' – another person living with HIV – to whom they were introduced through a support group, and subsequently received cotrimoxazole (Septrin) prophylaxis. In the study presented this week, investigators recruited a prospective cohort of 589 HIV-positive people with CD4 cell counts above 350 not yet eligible for treatment and without symptomatic HIV disease (WHO stages 3 or 4), of which 361 received the CarePack intervention. Individuals received HIV care through Kisii Provincial Hospital and Kisumu District Hospitals. Quite a high proportion of those in the control group used both water purification methods and insecticide-treated nets, but the intervention group had a significantly higher usage of insecticide treated nets (97.7 vs 83.1%, p<0.001) and were significantly more likely to report that they slept under it (mosquitoes that spread malaria are most active after dark and in low light, so using the net consistently at night is a very important means of protecting against malaria). The intervention resulted in a 27% reduction in the risk of disease progression to a CD4 cell count of 350 or below during the two-year follow-up period (HR 0.73, 95% confidence interval 0.57 – 0.95), and those in the intervention group were also at lower risk of reaching a composite endpoint of either CD4 cell count below 350 or death from non-traumatic cause (HR 0.75, 95% CI 0.58 – 0.79). There was no significant difference in risk after controlling for cotrimoxazole prophylaxis use or toilet type. The study also found that the extent of CD4 cell decline was significantly lower among those who received the long-lasting insecticide-treated nets and water filters (-54 vs – 70 cells/mm3 per year). People in the intervention group were also significantly less likely to report diarrhoea (HR 0.65), malaria symptoms (HR 0.75) or to be diagnosed with clinical malaria (HR 0.66). Stéphane Verguet of the University of Washington presented a cost modelling of the impact of the multi-disease prevention interventions if they were rolled out to the entire population living with HIV in sub-Saharan Africa, showing that substantial savings could be achieved in a number of countries. Using data from the Kenyan study of the impact of malaria and water-borne disease prevention on HIV disease progression, Verguet and colleagues in the University of Washington Global Health department applied these data to a model that incorporated epidemiological and costing data from sub-Saharan Africa. Antiretroviral treatment was estimated to cost US$722 per year and the intervention package was costed at $22 a year. The model found that for Kenya, a nationwide integrated disease prevention campaign costing $7 million might save $28 million a year in antiretroviral costs, and save 2200 lives from HIV-related death. The model did not incorporate the impact of a nationwide integrated disease prevention campaign on deaths from either malaria or water-borne diseases in the HIV-negative population. A nationwide campaign would achieve a similar impact in Mozambique, while in Nigeria, with a much larger population, and a larger numerical HIV burden, a campaign costing $16.7 million would save $67.3 million. Modelled across the whole of sub-Saharan Africa, universal implementation of an integrated disease prevention campaign would save $402 million in antiretroviral costs, around 8% of the PEPFAR antiretroviral drug budget, Verguet and colleagues estimated. These savings are likely to be attractive to donors, speakers at a satellite meeting on Integrated Multi-Disease Prevention Campaigns agreed. “We’re already thinking about 23 million people needing treatment so I think you’re going to be hearing a lot more about these approaches,” said Dr Reuben Granich of the World Health Organization. Eran Bendavid of Stanford University pointed out that campaigns of the type conducted in Kenya can reduce the costs to donors while doing more with the money and bringing together disparate disease targets funded by different countries and agencies into a single programme of work. Stéphane Verguet observed that the implementation of campaigns in rural areas underserved by health services had the potential to reduce inequities in access to services and health care, and to reach the poorest section of the population. “The individual interventions – safe water, insecticide-treated nets, HIV counselling and testing, cotrimoxazole, antiretroviral therapy – are already recommended by WHO. What’s new is putting them together like this. What’s needed is coordination,” said Dr Granich. Future campaigns may not stop at water safety, HIV testing and malaria prevention. Mikkel Vestergaard of Vestergaard Frandsen, which sponsored the studies, said the company was already in discussions with potential partners regarding the feasibility of carrying out integrated prevention campaigns that include cervical screening for prevention of cervical cancer, and male medical circumcision for HIV prevention. Verguet S et al. 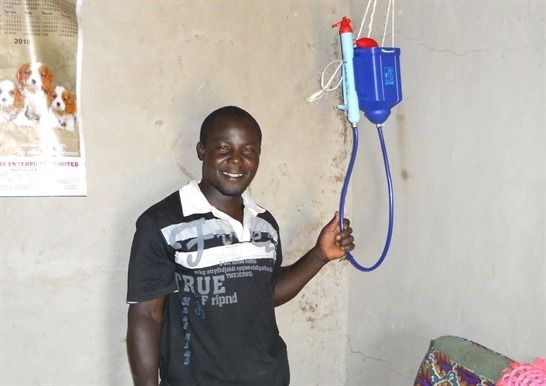 Cost savings associated with the provision of a simple care package including long lasting insecticide treated bednets and a point-of-use water filtration device to delay HIV-1 disease progression in Africa. 19th International AIDS Conference, abstract MOPE768, Washington DC, 2012. Walson J et al. Provision of long-lasting insecticide treated bednets and a point of use water filter to delay HIV-1 disease progression. 19th International AIDS Conference, abstract WEPE044, Washington DC, 2012.